If the militarized security strategy that Tahoe Resources has used to put its Escobal silver mine into operation isn’t enough to raise questions about the ethics of the company’s operations in Guatemala, the recent resignation of Guatemalan President Otto Pérez Molina should be. Pérez Molina stepped down on September 2 after Congress voted to strip him of his political immunity. A week later, he was indicted on charges of illicit association, customs fraud, and bribery for his involvement in a customs network that robbed tens of millions of dollars of taxpayer money. Rewind to July 2013, when former President Otto Pérez Molina made a personal site visit to the Escobal mine located in San Rafael las Flores in the department of Santa Rosa. The visit took place just a few months after Tahoe’s head of security was arrested for his role in the shooting of seven peaceful protesters and a subsequent month-long military state of siege was imposed on four municipalities in the area. 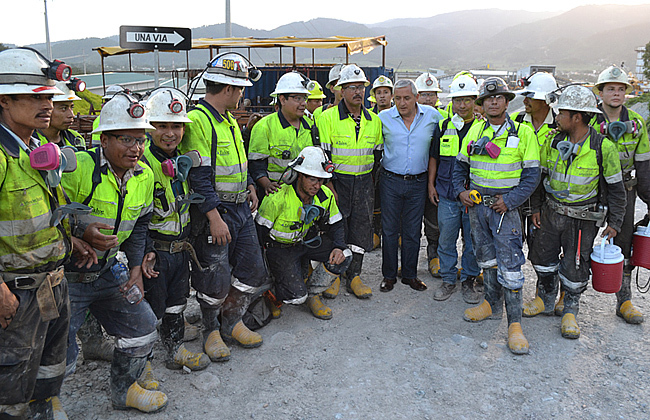 While at the mine, Pérez Molina mingled with workers and filmed a national television address affirming support for the project. Today, Pérez Molina is accused of heading the “La Linea” customs fraud ring that is said to have benefited transnational companies by offering lower import taxes in exchange for handsome pay-offs to politicians. Vice-president Roxana Baldetti has also been indicted on the same charges and over a dozen cabinet ministers potentially implicated in the fraud scandal have resigned, including Minister of Energy and Mines, Erik Archila. Archila approved Tahoe’s exploitation licence in April 2013 without taking into consideration over 250 individual complaints filed against the licence for potential impacts on water and health of the local population. While it is unclear if Tahoe or other North American mining companies such as Goldcorp benefited from the fraud ring, the company’s cozy relationship with Otto Pérez Molina's scandal-ridden government has been well documented. During his administration, state-sponsored repression plagued communities in resistance to Tahoe and has facilitated the imposition of the Escobal mine against the will of the local population. It is too soon to know how the recent general election results may change this arrangement, but cracks have already started to show in the company's political support at the local level. During the past four years, Tahoe has relied on the mayor of San Rafael Las Flores to prevent local communities from holding a referendum about whether or not they want mining in their municipality. While six municipalities surrounding the Escobal mine held referenda overwhelmingly rejecting mining, residents of San Rafael las Flores were denied this important opportunity. In response, nine villages within the municipality organized their own referenda, in which the majority overwhelmingly rejected the Escobal mine. Results from Guatemala's general elections held September 6 indicate an important shift in support for Tahoe Resources in San Rafael las Flores, as well as in the surrounding areas. In San Rafael Las Flores, Roberto Pivaral, member of the Committee in Defence of Life and Peace who was an early victim of Tahoe's strategy to criminalize opponents, won enough support in rural areas of the municipality to win the mayoral race on a pro-referendum platform. In the neighbouring municipality of Mataquescuintla, where 96% of voters opposed mining in a 2012 referendum, Hugo Loy was re-elected as mayor. Loy has openly opposed Tahoe’s presence in the region and has fought hard to uphold the results of the 2012 vote by opposing the construction of an electrical line between Mataquescuintla and the Escobal mine. Opponents to mining in Mataquescuintla have faced severe threats and violence, including the 2014 attack in which 16-year old Topacio Reynoso was murdered and her father Alex was seriously injured. Rejection of Tahoe Resources also came through loud and clear in two other municipalities close to the Escobal mine. In Santa Rosa de Lima, residents ousted the candidate who had accepted royalty payments from the company and elected community leader and pro-referendum candidate, Llan Carlos Dávila. In Nueva Santa Rosa, voters re-elected the current mayor who, due to community pressure, has so far upheld the results of the consultation and refused to accept mining royalties. In a press release issued following President Pérez Molina’s resignation, Tahoe Resources asserted that all is calm in Guatemala and that business will continue as usual. Tahoe expressed support for acting President Alejandro Maldonado Aguirre, who became Vice President after the resignation of Roxana Baldetti. Tahoe stated Maldonado has been "the force of calm in the country" and that "his leadership has been viewed within Guatemala as very positive." However, Tahoe fails to mention that Maldonado, a former Constitutional Court judge, is also a founding member of the now non-existent National Liberation Movement party (MLN in Spanish), an extreme right-wing political party known for its connection to death squads in the 1960s. The company also does not say that during his time in the Constitutional Court, Maldonado voted to annul the historic 2013 genocide sentence and one year later, voted for the early removal of respected Attorney General Claudia Paz y Paz. Finally, Tahoe assures investors that, “The embassies of Canada and the United States are heavily involved in assisting and supporting the Guatemalan government’s efforts to maintain order and peace and assure stability during these difficult times.” But, far from deserving congratulatory remarks for their role, serious questions should be raised about what North American Embassies in Guatemala might have known about rampant corruption in the Otto Pérez Molina administration. They should also be challenged for their willingness to demonstrate support for such a repressive regime in order to protect Canadian and US economic interests in the country. Rather than providing staunch support to ensure the interests of mining companies, such as Tahoe Resources, Goldcorp, KCA (Kappes, Cassiday & Associates) and others, Canadian and US authorities should push for investigations as to whether these companies were benefiting from the customs fraud ring and make a commitment not to provide any support for mining activities where communities have not given their consent.